A trusty combination that goes well with millet or rice, this colorful dish will satisfy the whole family and fetch compliments at potlucks. Sizzling spices liven up chopped vegetables every time. If you find peas and carrots too sweet to eat as a main dish, try it this way, with some tofu, ginger and the South Indian spice combination known as tiragamuta. Sizzling spices with split legumes – aka tiragamuta. If ginger alone is not hot enough to balance the sweetness of the peas and carrots, go for the authentic flavor and slice some green chili pepper into the pan as the legumes in the tiragamuta are sizzling. 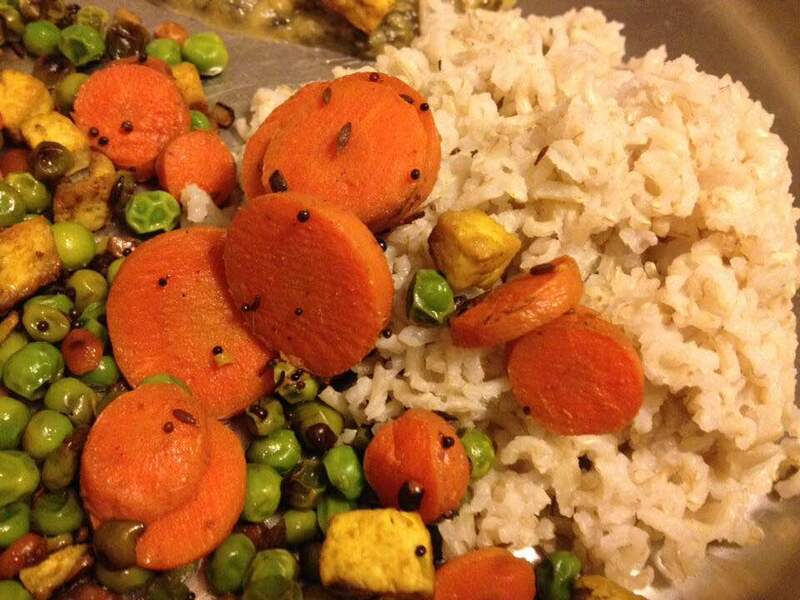 I say authentic not because pea-carrot kura is a traditional South Indian dish, with or without tofu. (It is not.) But because where there is ginger, there is usually also green chili. In fact, I would be hard pressed to think of a South Indian main dish that does not contain green or red chili. Or both. You can play with the ratios on the pea, carrot and tofu. You can use equal parts of the three, but I tend to use 2 parts carrot for 1 part pea and 1 part tofu. Carrots are one of the few vegetables whose nutrients become more available to us after cooking so I use this kura as an opportunity to eat more cooked carrots and get my Vitamin A. Did I mention that this is not a traditional Indian entree? Not anywhere I have been, I can say that for sure. In fact carrots (along with cauliflower, cabbage and some others) are called “English vegetables” and there is no Telugu word for them. There is a word for carrot in Hindi (gajjar) but the only preparation I can think of is gajjar ka halva, a sweet dish. Ready! Serve with freshly cooked millet or rice. For those who thought carrots were only for salads or sweets, here is a dish that will awaken your palate to a whole new role for carrots. A satisfying stir-fry that is colorful and spicy. At present, I am the only person I know who makes this delightful dish. Maybe you will change that! Remove tofu from container and press to remove excess liquid. Chop into cubes a bit smaller than 1 cm per side. Wash carrots. Slice into circles or semicircles, not too thinly. You may also quarter carrots lengthwise and chop into pieces that almost look like cubes, similar in size to the tofu cubes. Optional, time-saving step: Pre-cook the peas and carrots separately in the microwave. Use glass or ceramic microwave-safe bowls. Peas: Put the peas in the bowl with 1/4 cup water and cover with a heavy lid or microwave-safe plate. Cook for 3-4 minutes. Carrots: Put the carrots in a bowl with 1/2 cup water; cover with a heavy lid or microwave-safe plate. Cook for 5-6 minutes. While pre-cooking the vegetables, you can turn on the stove to medium-high (6 or 7 out of 9) and let the spices start sizzling. In a cast iron or sturdy stainless steel pan, heat oil and add the ginger, chana dal and urad dal, preferably in separate parts of the pan until they all start sizzling. Stir and when they are sizzling well, add cumin and mustard seeds. The mustard seeds should pop, which means the oil needs to be hot. Add the tofu and continue frying for 7-8 minutes, stirring as needed and adding another spoon or so of oil. The tofu will brown slightly and become more firm. Just before moving to the next step, add curry leaves and let their aroma fill the kitchen for a few seconds. Add the pre-cooked vegetables, salt and turmeric. Stir and reduce heat to medium (4 or 5 on a scale of 1- 9). Continue cooking for 5-7 minutes, stirring every 2 minutes. If you did not pre-cook the vegetables, continue cooking until carrots are just tender and peas are thoroughly cooked. Serve with cooked millet or rice. On each plate, drizzle with flax oil.